Reviews from a few satisfied clients. I just read through [editor’s] edits and I am thoroughly pleased! [The editor’s] extra pair of eyes made my document read so much better than before. Thanks so much the quality work! And one more thing about [my editor’s] style of editing. [The editor’s] constructive questions are so instructive and my writing ability improves after I read [the editor’s] suggestions. I have found that the type of editing that [the editor] has done for me helps to make my writing a more coherent argument and stronger document in the end. Thank you so much! This is amazing already. I haven’t had a chance to rework it thoroughly yet but I will and get back to you. Just wanted to touch base to say thank you and confirm I received the paper. Based on this one experience, I will never publish another paper without sending it to you first. OMG. A large part of our success goes to you guys who make our work so much easier to read and ultimately accessible. AND it shortens our drafting and publishing cycle. I highly recommend Oxford Editing for its thoroughness and I am very impressed with Susan’s choice of editor for my work. [My editor] is incredibly knowledgeable and, in addition to looking at the essay for the usual grammatical and organizational concerns, he added a great deal of commentary, even though he did not have much to work with. I can only imagine what he would have done with 25 pages. 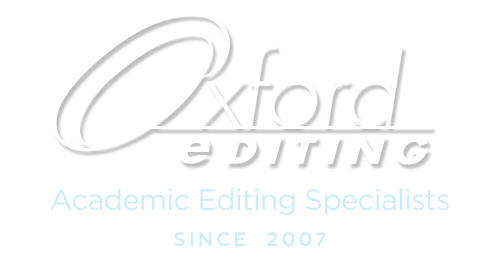 There are many competitive academic editing services on the Internet, but Oxford Editing truly does cover many disciplines. Susan makes every effort to find an editor tailored to one’s specialty. She responds to queries quickly, is extremely courteous and she will still correspond with you long after Oxford Editing has completed the editing and you have moved on to other projects. Oxford Editing is truly one of the more exceptional academic editing services of the many on the web! Oxford Editing has done a fantastic editing job on my book Holy Herbs. I found the execution of editing work flawless. The book manuscript was transformed by the editing team of Jennifer and Kathy, managed by the able Managing Editor Susan Hatch Morgan. I knew I needed editing help for my first book describing an academic problem for a lay audience. Not in grammar and punctuation, I’m fine there. I wanted an editor who could help me with logic and clarity of presentation. I found a list of freelance editors and sent a couple of sample pages to five of them, with a check and a request to give me a sample edit. Each had some good suggestions, but mostly at the level of improving individual sentences. None of them worked at the higher level I needed. So I wrote another five editors. Four of them were as deficient as the first batch. But the fifth, who was suggested by Susan Hatch, was terrific: exactly what I wanted, and more. I told Susan I wanted to work with him. What a great decision! He has been wonderful, providing my manuscript with a careful and critical read that highlighted errors, assumptions, sloppy thinking, and much more on every page. He improved the quality of the book substantially, and I am grateful to Susan for connecting us. Oxford Editing exceeded my expectations in every way possible. They not only did a fantastic job of mechanically editing my manuscript, but offered insightful comments into the content, logical coherence of the material as well as many structural and stylistic aspects of the work. The end product is more user-friendly than I had imagined, and readers consistently tell me that the book is easy to read. While it would make sense that most books would achieve these goals, I couldn’t have done it without Oxford Editing’s guidance and direction on the endeavor. I am very satisfied with the service. This is actually the second time I’ve used your service — because I thought it was great the first time as well. Fully professional — great service! Professional + reliable + friendly + initiative = Sure, my next choice as well! [Oxford Editing] provided the outside viewpoint that my PhD dissertation in corporate finance required. [The editor] helped strengthen my writing and focus my ideas. His academic background and knowledge of research methods also proved insightful. As an English-as-a-Second-Language author, writing in English has always been a difficulty for me, making the process of preparing a manuscript for publication even more tedious. However, after I tried Oxford Editing for the first time things became much easier. This is the third time I have worked with them and I am truly impressed with their outstanding professionalism: quick response, thoroughness, insightful suggestions and kindness. I greatly appreciate their thoughtful comments, which have helped to make my manuscripts much clearer and easier to read. I also would like to point out that Susan contributes to making the experience even greater; she is not only very professional, but also, she is very friendly and kind. I am very pleased with their work and I would highly recommend them. I appreciate your professional services and would love to return to you soon. I highly recommend Oxford Editing to those for whom English is their second language. Their editors are always reliable and friendly. They not only edit your work but help you learn to write sentences that are forceful, straightforward, and clear. 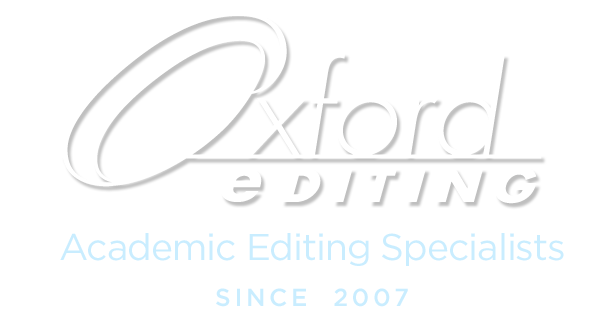 As an ESL academic, I am totally satisfied with Oxford Editing’s service. They not only helped to enhance the intelligibility of my writing but also provided insights into the weakness of my argument. The effective communication between the client and the editor is also impressive. In a word, Oxford Editing is as trustworthy as their website claims. The editor did a wonderful job with my proposal! You are right in saying she is a peach, in more ways than one. I don’t know how, but she managed to edit the proposal to almost half its size, something that it desperately needed. I spent the whole day looking through her edits and insightful suggestions. You were right after all — what this proposal needed was a good editor, more than an expert in English lit. Thank you all, you and [editor], for all your professionalism. I’ll surely think of you again when I need editing services..